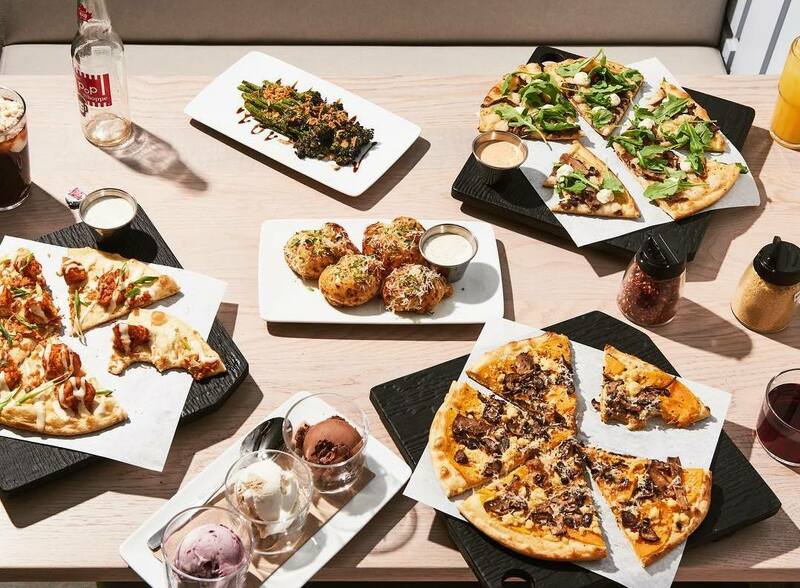 The plant-based movement is kind of a big deal here in health-conscious Vancouver, and not just for vegetarians — meat-eaters are now opting for veggie dishes, too (how is it possible for cauliflower to taste so damn good?!). 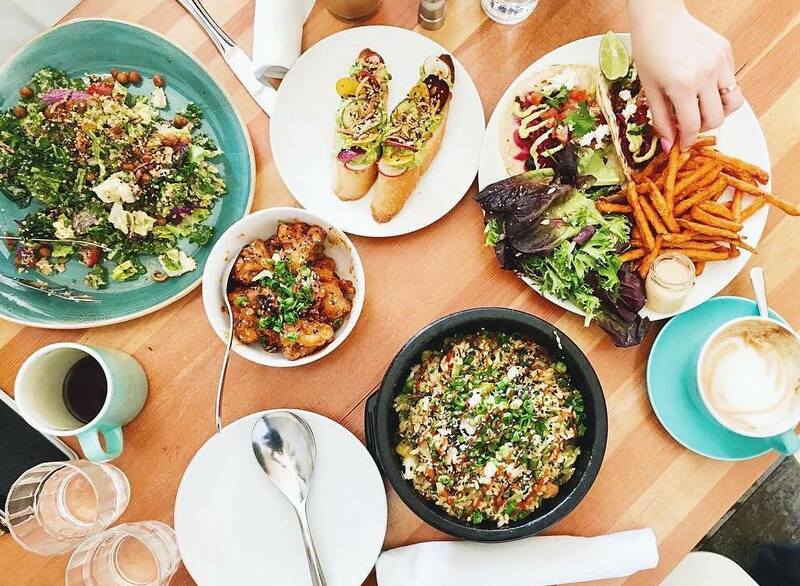 You can easily eat out at a different vegetarian restaurant each day of the week… and we don’t blame you if you do given these delicious options. North Vancouver, where you at? We haven’t forgotten about our mountain-loving friends across the water. 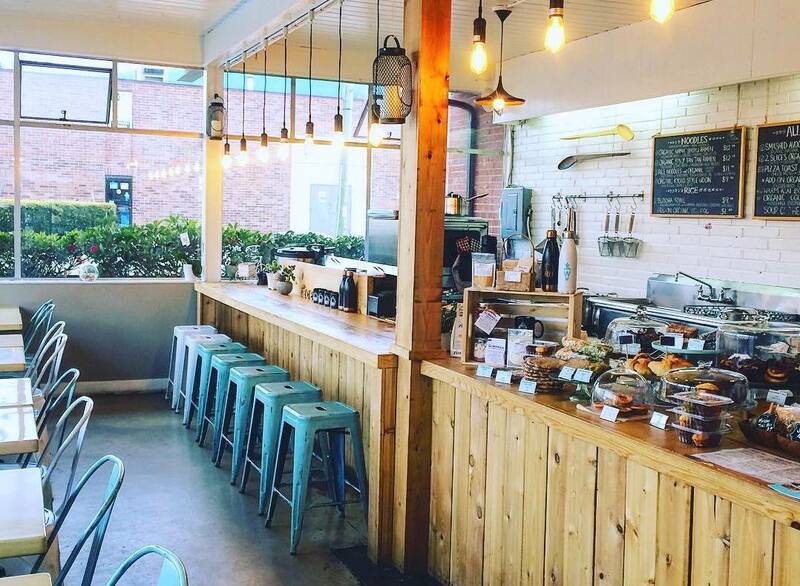 Workshop Cafe has got you covered with their cute ‘n cozy location on Pemberton near Capilano Mall. 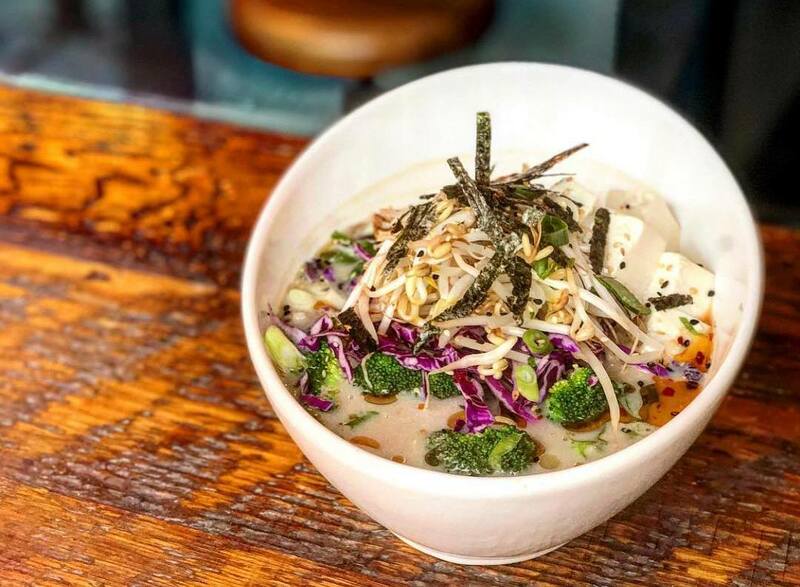 Not just for veg-heads living on the shore, this place caters to ramen-lovers across the city with their Japanese fare. Your first spoonful of Organic Spicy Tan Tan Ramen will make you forget the traffic jam you sat in on Lionsgate to get here! Midnight snackers rejoice — this place is open 24 hours a day, seven days a week. You never need go hungry again! Not only is The Naam there for you when you need them the most, they also have one of the broadest, 100% vegetarian menus in town. 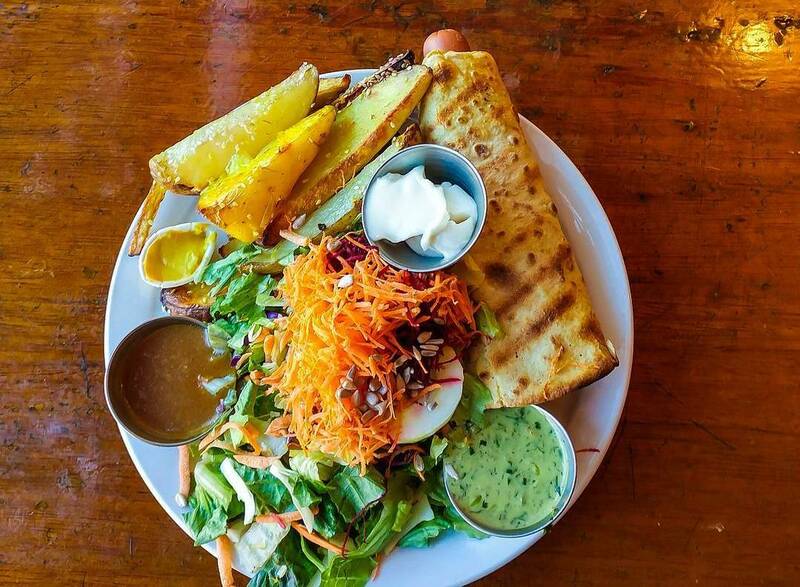 Founded back in 1968 in hippy enclave Kitsilano, this is also one of the city’s oldest veggie-friendly hot spots, and we are happy to report that they still maintains their local, independent roots. The meals are of the hearty and delicious variety, guaranteed to satisfy even the most stubborn of meat-eaters. Try their famous Miso Gravy — so good it’s now sold in retailers across Canada. Gelato — it’s different than ice cream. Gelato is the really good stuff; the creamy scoops you see piled high in gelaterias across Italy. It’s smooth and flavourful, and some might say it’s impossible to recreate dairy-free. 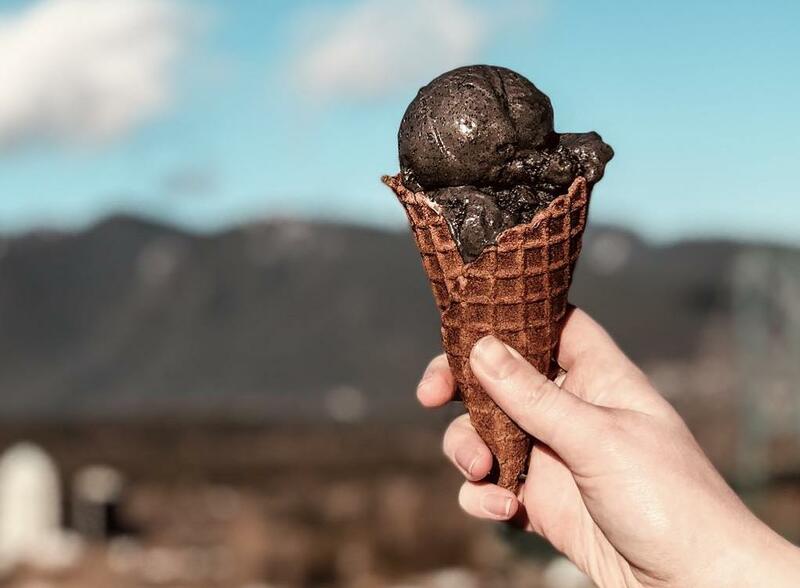 Well, those people would be wrong — Umaluma on East Pender St. serves up organic, healthy, dairy-free gelato that’ll satisfy even the stuffiest gelato connoisseurs’ cravings. Mojito majik, drunken cherry, lavender dream are just the tip of the ice(cream)berg. Tera V Burger is like McDonald’s but fully vegetarian and not as corporate. Here, you’ll find oven-baked fries, no chemicals, and a much tastier menu. Believe it — fast food that’s actually pretty good for you. 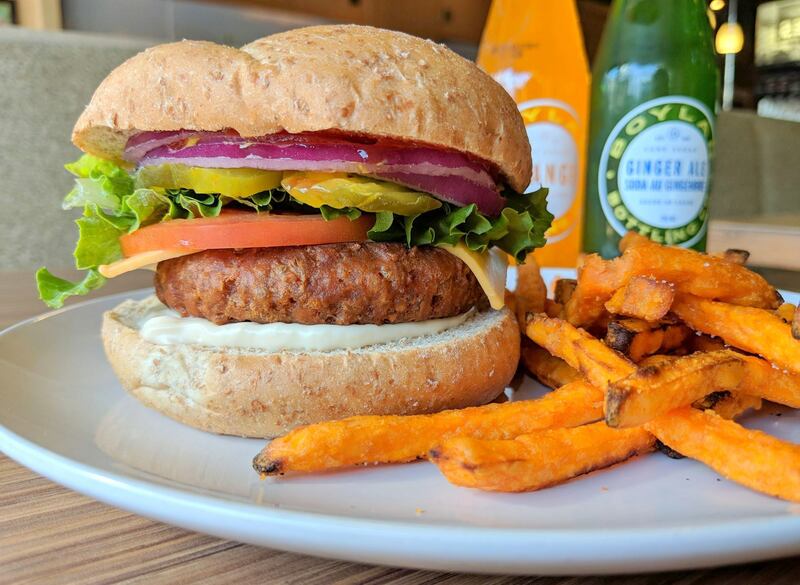 Our go-to at this Kitsilano cafe is the Barbeque Tempeh Burger with yam fries. The bun is whole grain, the patty organic, and the salad is made with fresh produce that’s sourced locally when possible. Feeling lazy? They’ll deliver right to your door. On weekends, we brunch. 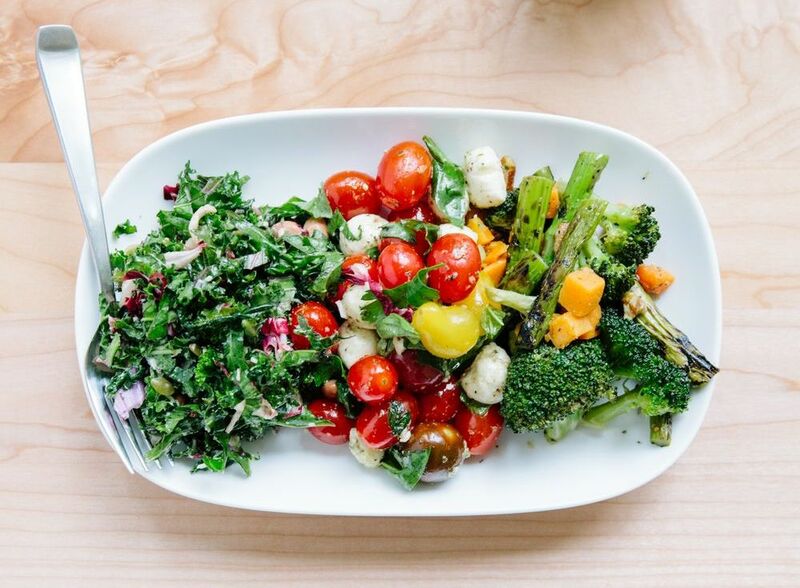 And we can’t think of a better place to dose up on delicious veggies than at South Granville favourite, Heirloom. 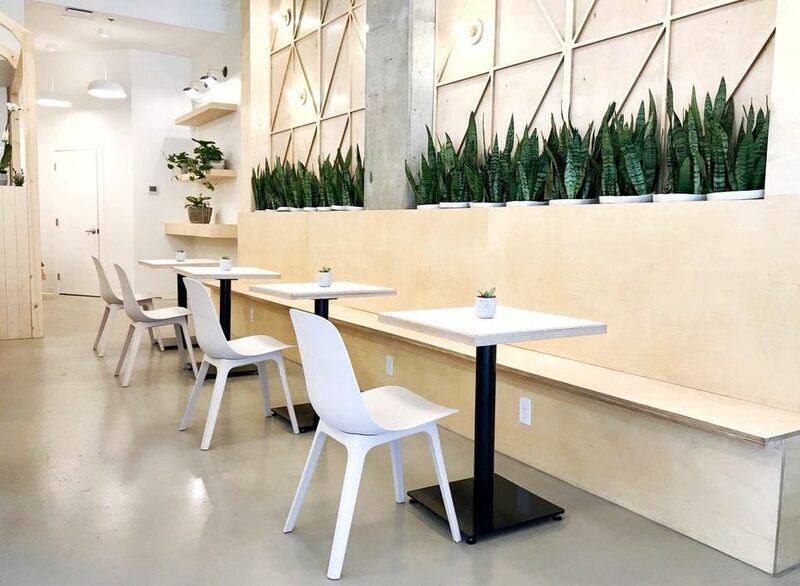 This eatery is known for their beautiful, light, and contemporary space and their commitment to supporting the plant-based movement. Vegan-friendly, but not fully vegan, they are happy to use natural ingredients as long as they ‘don’t have a face’. They’re such a hit, they recently opened a new location in Kits on West 4th. Oh, and be sure to add an E3 Lemonade to your order — a turquoise elixir of green algae, honey, lemon, and sparkling water. When you’re in the mood for casual comfort food in a cozy setting head over to this eatery on bustling Main Street (they also have locations in Gastown and Yaletown). Let’s stop beating around the bush and get straight to the point: Hot Chiggin’ Things — order them. Holy vegan wings, these bad boys are the bomb! And like the star of the show, the entire menu is inspiring, and the portions are plentiful. Some advice: arrive wearing loose pants; you’ll need the extra room. Pizza and ice cream! Need we say more? 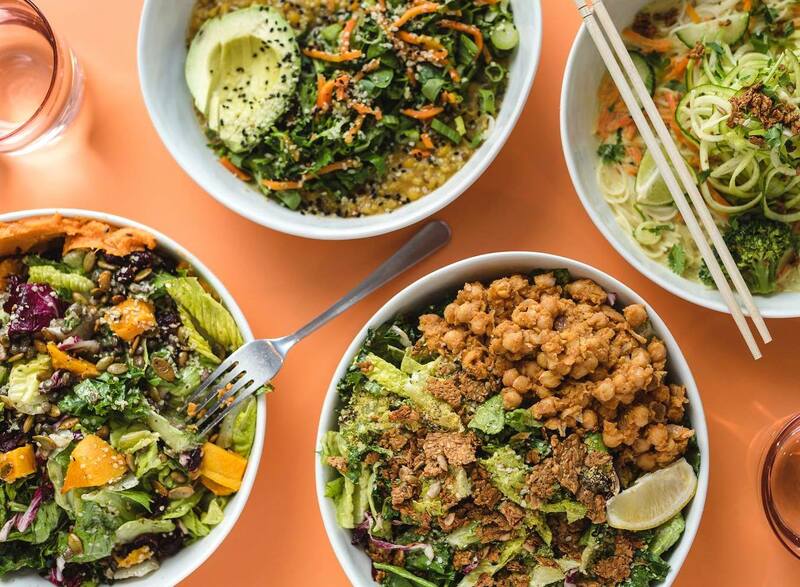 Well, yes, actually, we need to; this fast-casual restaurant is also 100% vegan and plant-based (say whaattt?). Hand-stretched dough with nut-based cheeses are the platform for a multitude of unique toppings. Our favourite is the Kim-Jack — hoisin crema, cashew mozzarella, kimchi, gochujang-braised jackfruit, roast broccolini, and scallion. Obviously, this ain’t yo’ average pizza joint. 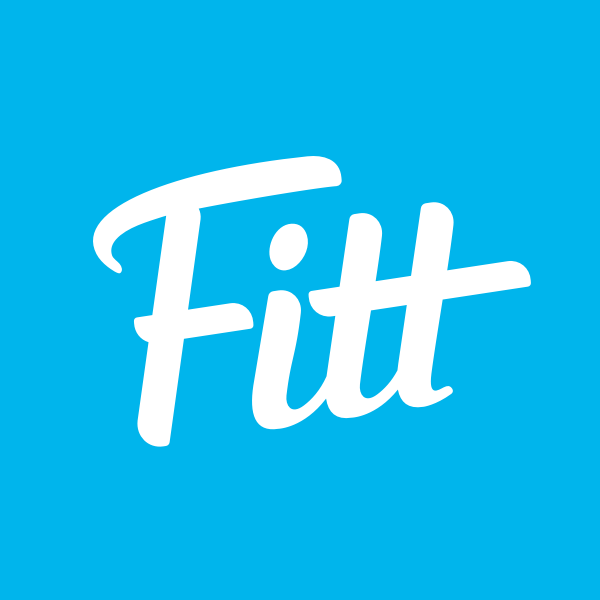 Fitt Tip: this little place in Chinatown and UBC Wesbrook Village can get pretty busy; order online for delivery or pick-up and skip the line! It seems the best way in Vancouver to open a new restaurant is to test the waters and build a following is by opening a food truck first. This is the story of Chickpea — now brick-and-mortar vegan restaurant with a Mediterranean twist on Main St. The menu is extensive and you’re encouraged to share, so gather a group of friends and dine in ‘Hafla-style’. 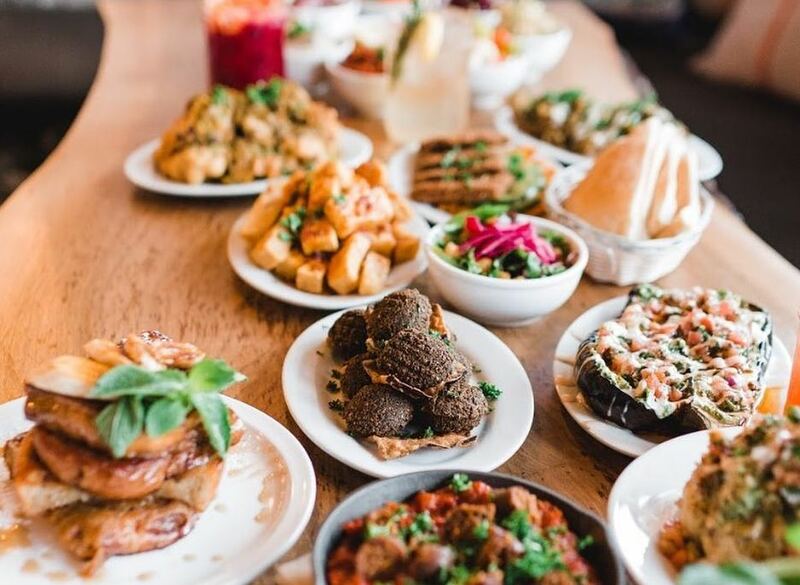 With that, you each pick a main dish which is served to you with hummus, salad, and pita along with the restaurant’s selection of ‘Salatim’ (basically really delicious, rainbow-coloured appies). Clearly, we wouldn’t suggest coming here if you don’t like to share your food! Appealing to veggie- and meat-lovers alike with their mix-and-match salad bar concept (on any given day there are around 12 options to choose from), Tractor is your go-to lunch option. Priced by the scoop with optional add-ons liked grilled avocado, tofu, or curried cauliflower this is easily the most customizable menu in town. With locations in Kits, downtown, and Olympic Village, their goal is to make everyday health food easy and manageable, and we think they’ve nailed it. When it’s cold and rainy outside, head inside to Kokomo in Chinatown or Kitsilano — it’s always summer here! A quality over quantity menu focusing on seasonal produce (changing weekly) means there is always something new to try. The Coastal Macro is a firm favourite; tuck into brown rice, greens, tempeh, roasted squash, cucumber, ginger, pickled cabbage, edamame hummus, and Thai ginger dressing. Um, yum. And we’d have to recommend the bowls. Aren’t bowls are the best? We’d eat everything from bowls if we could. 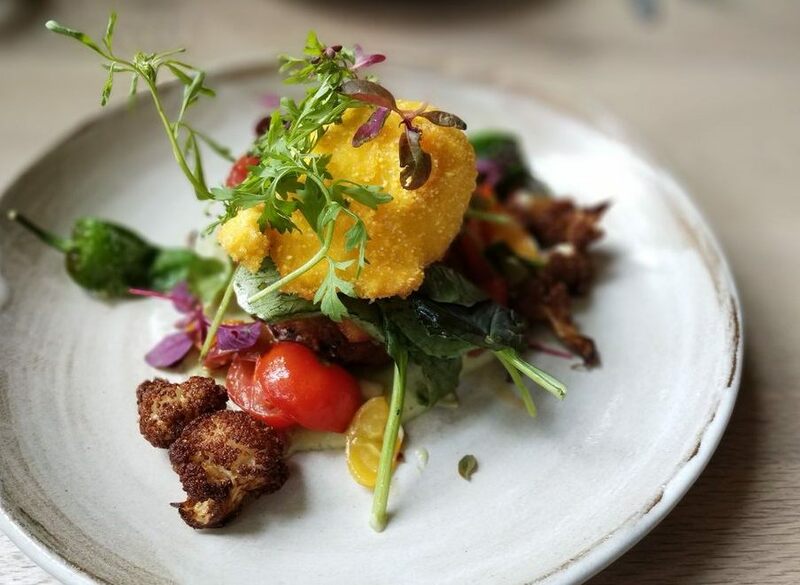 Another addition to the incredible vegetarian restaurant scene on Main St., The Acorn was winner of ‘Best Vegetarian Restaurant’ at the 2017 Vancouver Magazine awards and named in the top 25 Vancouver restaurants in Scout Magazine to boot. We will leave you to make up your own mind on that, but we can confirm, this place is pretty special. Seasonal produce from local farms, beautifully presented dishes with a sharp cocktail menu to match — this is your date night option. Plus, at the end of dinner, they give you with a card from their ‘Artist Series’, where each month they profile work from a different local artist. Nice touch, Acorn; you’ve got a good thing going. Step off Victoria Dr. and into this Vietnamese, family-style kitchen which offers a full vegetarian menu. We’ll admit, it can sometimes be a little overwhelming when presented with a menu of exotic eats with names we aren’t familiar with. Luckily, CHAU offers a photographic menu — and no, not the awful, tacky, laminated kind. This menu includes the kind of photography that makes aspiring foodie accounts Insta-famous. 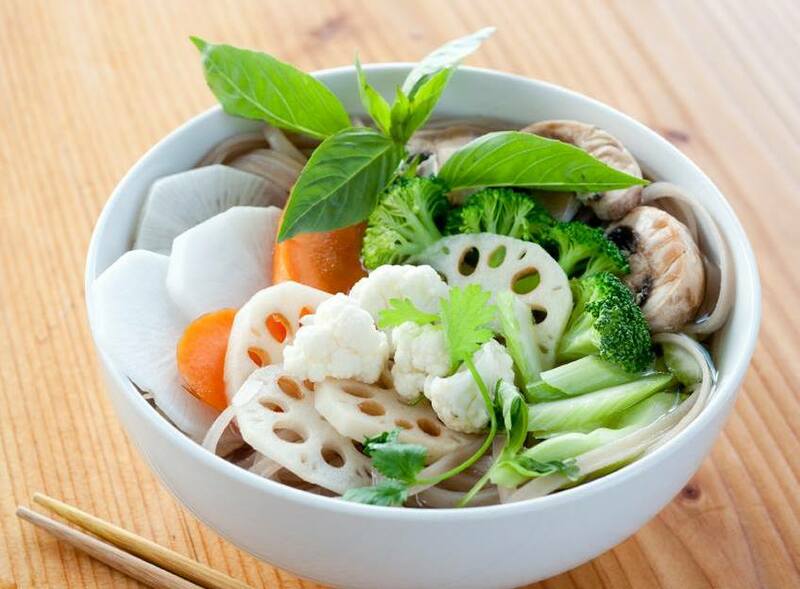 They serve lots of colourful, fragrant, nutrient-dense bowls with names like ‘Midnight Swim Bowl’, which will transport you right to the streets of Hanoi. Because that’s the idea; the dishes were inspired by the personal adventures of two friends in Vietnam. Next, you’ll be booking your flights there, too! If we could eat at The Acorn every day, we would, but let’s get real — most of us can’t really afford that luxury because #reallife. 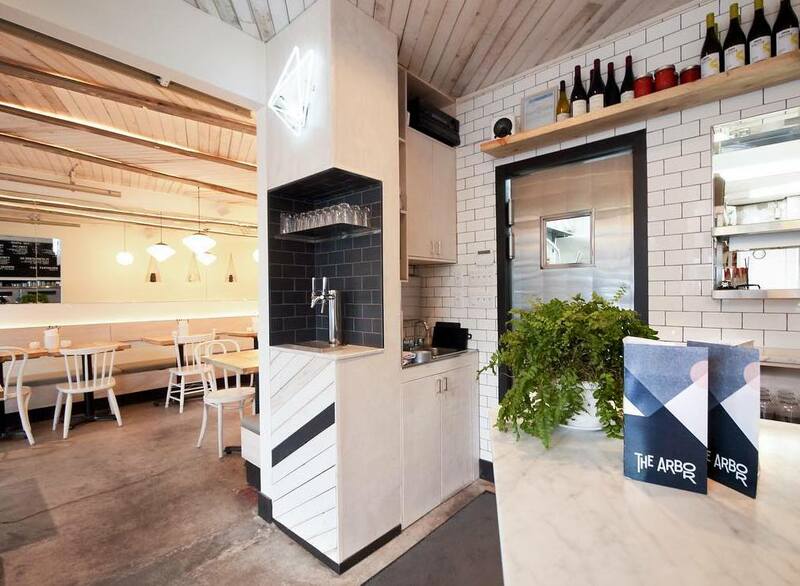 Thankfully, The Acorn thought about that #firstworldproblem and opened an equally awesome, but slightly more casual, faster-food joint just down the road called The Arbor. 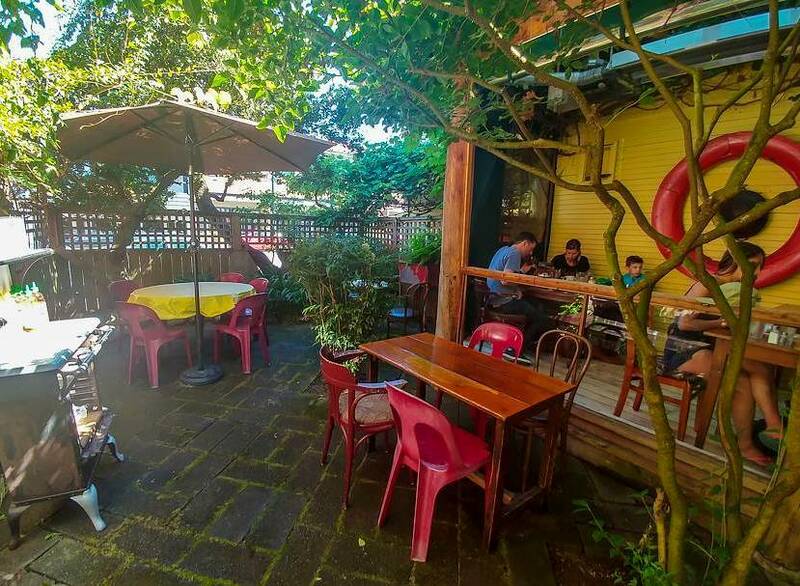 Come here in the summer and you can enjoy their patio whilst munching on a 100% vegetarian menu with plenty of vegan options, too. Veggie burgers, Pulled Jackfruit Steamed Buns, Artichoke Nuggets, Broccoli Popcorn — kale yeah! There’s a reason this W. Broadway eatery describes their cuisine as ‘food for the soul’. Dig into freshly-prepared plant-based eats that will nourish your body and keep those hunger pangs at bay. For brunch, order up their Vegan Benedict — English breakfast muffins with a baked tofu layer of portobello mushroom, avocado, hollandaise, and a side of yam hash. But if you’re looking for something a little heartier, go for their Almond Alfredo Spaghetti, vegan brown rice sushi (the Mango Maki roll is a must), or their Meatless Meatball Sub made from sunflower seeds, sundried tomatoes, herbs, and mushrooms. Really, though, there are no wrong choices here. 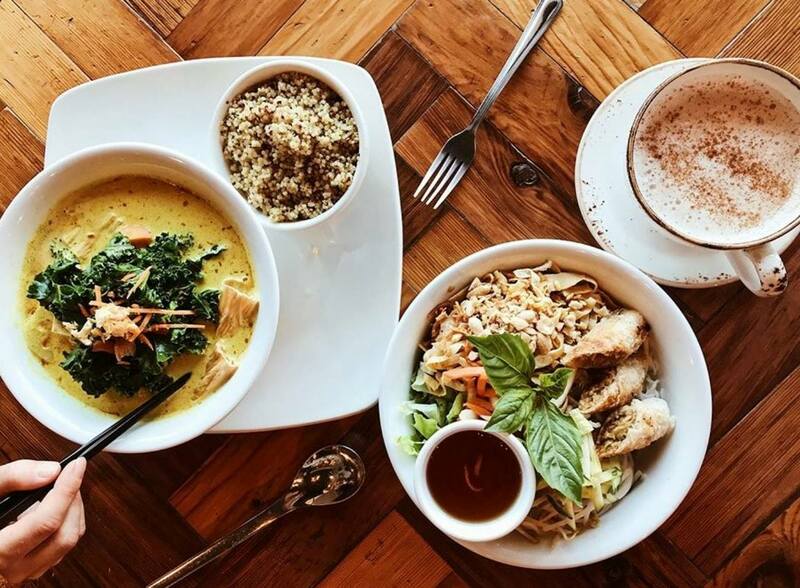 If you find yourself on Main St., just make sure you don’t head home without at stop at Greenderful, the home of delicious plant-based eats and sips. Craving juice? Their selection of cold-pressed concoctions, including flavor-packed bottles like Green Tonic and Kale Nation, have you covered. Or, order up one of their refreshing smoothies like Sport Recovery or Morning Kickstarter. In the mood for something more substantial? This eatery also offers a menu of organic salads. Our pick? The Rainbow Salad made with spinach, arugula, avocado, quinoa, red cabbage, radish, carrot, and pumpkin seeds, and topped a blueberry vinaigrette. 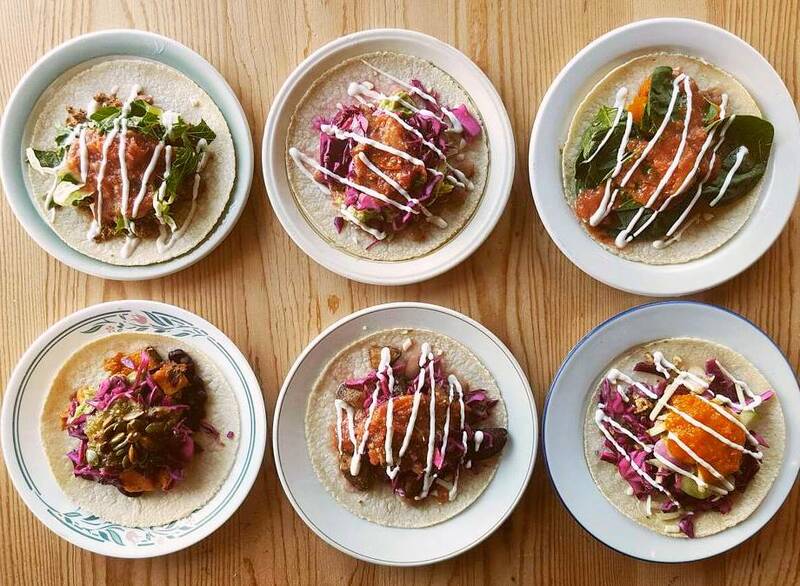 Mexican-inspired vegetarian food — need we say more? You can catch the Bandidas Taqueria food truck cruising down the streets of Vancouver or at various events across the city. But if you’d rather pull up a chair and stay awhile, pop by their sit-down restaurant on Commercial Dr. They serve an epic all-day breakfast menu, with the highlight being their burrito — scrambled eggs, pinto beans, roasted tomato salsa, and sour cream all wrapped up in a whole wheat tortilla. The rest of their menu doesn’t disappoint, either. Treat your taste buds to their selection of fajitas, quesadillas, and enchiladas. The best part? Many of their veggie dishes can also be made vegan or gluten-free.